I've mentioned my Instant Pot before, and it really is a genius appliance (and they don't pay me to say that!) Risotto in the Instant Pot might just be one of its best uses, because it turns risotto from a standing-over-the-stove dish to set-it-and-forget-it on a weeknight. There are a few minutes of sauteing onions and toasting rice at the beginning, but then everything gets sealed in and pressure cooked to perfection. The texture is fantastic, and I found that the rice was perfectly cooked in 5 minutes at high pressure. 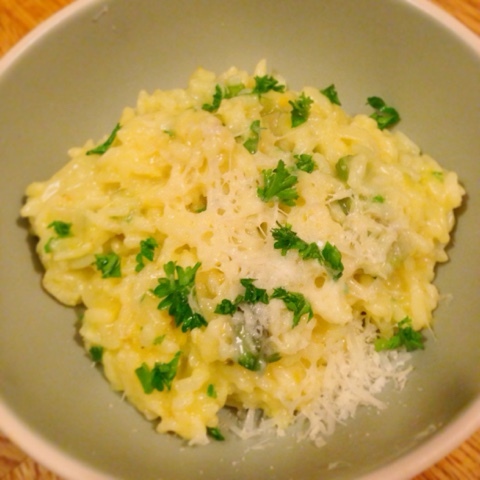 The flavors here are great for spring and summer -- fresh asparagus and parsley brighten up the rich risotto. The recipe below can be easily adapted to fit with whatever vegetables or proteins you prefer. Just roast or otherwise cook your add-in ingredients while the risotto is cooking, and then stir them in at the last minute. You just want to make sure that whatever you choose is fairly "dry" -- if you try to use a very liquid-y addition, it will water down the risotto. 1. Preheat the oven to 425 degrees. Line a baking sheet with foil. 2. Trim and wash the asparagus. Cut into bite-sized pieces. Toss with the oil and season with salt and pepper. Roast in the oven until browned and tender (timing will depend on the size of your asparagus spears). 3. Meanwhile, heat the chicken stock in a microwave or small saucepan until hot. Set aside. 4. Press the "Saute" button the Instant Pot and add the olive oil. When the oil is hot, add the onion and saute for a few minutes, until softened but not brown. Add the garlic, and stir for another minute. 5. Add the rice to the pot, and continue stirring for 2-3 minutes, until slightly toasted. 6. Add the wine and saffron to the pot, and stir until absorbed, 1 minute. 7. Add the hot stock, stir well, and secure the lid. Use the "Manual" function to cook for 6 minutes at high pressure. 8. When the timer beeps, quick release the Instant Pot, being careful to avoid the steam. Stir well, and set the Instant Pot to "Saute." If needed, cook the risotto further, stirring well (I was able to skip this step). Stir in teh butter and Parmesan cheese. When it is melted, turn off the Instant Pot and stir in the roasted asparagus and minced parsley. 9. Scoop into serving dishes, and top with more Parmesan and parsley. Fish in a packet is always an easy, tasty dinner, but this version is even better than usual with the addition of a red pepper-smoked paprika sauce. 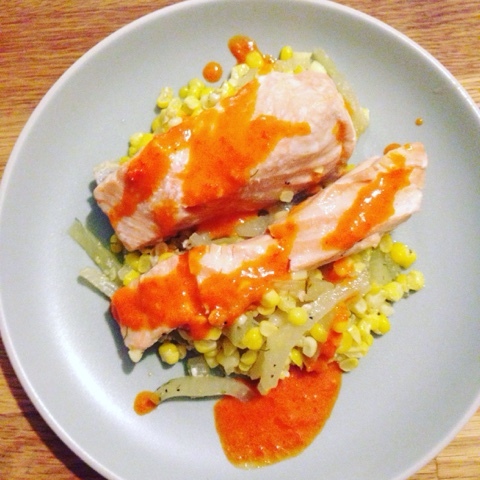 I love the combination of the anise flavor of the fennel with sweet corn as the base for this dish, and tender salmon goes well with both vegetables. While the fish is in the oven, blitz up a quick red pepper oil -- everything just goes in a mini chopper until smooth (or you can use a hand blender). The sauce would also be awesome on other fish or on chicken. This makes a delicious light dinner on its own, but if you're hungrier you can add some crusty bread and butter or a green salad on the side. 1. Preheat the oven to 450 degrees and lay out two large pieces of foil on a baking sheet. 2. Toss together the fennel, corn, and fennel fronds with a generous pinch of salt and pepper. Divide among the two pieces of foil. 3. Arrange the salmon on top of the vegetables, and season with salt and pepper. Drizzle with a little olive oil. Fold up the foil and pinch closed. Place in the oven for 14 minutes. 4. Meanwhile, place all the ingredients for the smoky red pepper oil in a mini chopper or a small bowl. Blend with a stick blender or mini chopper until smooth. Set aside. 5. Let sit for 5 minutes, then open the packets. Transfer to a plate and drizzle with the smoky red pepper oil. I've become a huge fan of the Cooking Light feature Cook Once, Eat 3x. The idea is that you make one base recipe, and then use it in three different dishes throughout the week. It definitely makes leftovers more fun, and also makes meal planning super easy since three meals are already figured out! 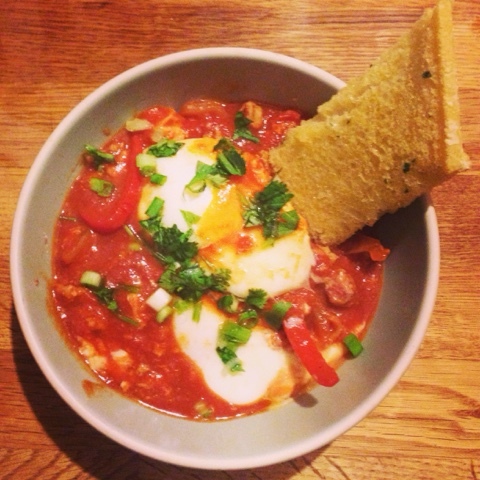 This particular set of recipes all focuses on a homemade chorizo mixture. The mixture is half turkey and half pork, although of course you could substitute in 2 pounds of prepared chorizo if you're feeling pressed for time. The chorizo gets incorporated into three recipes: savory stuffed sweet potatotes, decadent nachos (ours were definitely waaaaay less healthy than the Cooking Light instructions, as per usual, but you can check out their version if you want to make this "light"), and shakshuka-style baked eggs with a Tex-Mex twist. All the meals were really tasty, and different enough that it didn't feel like eating the same thing all week long. Yum! 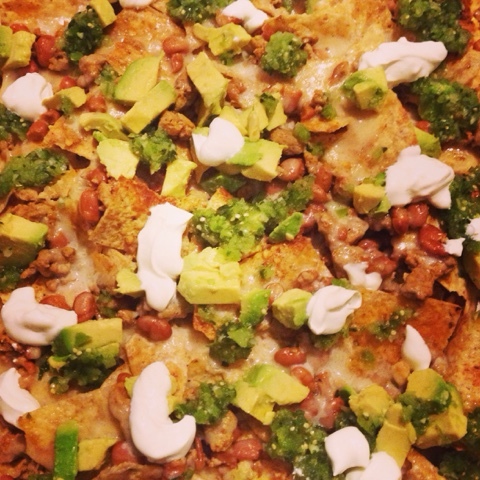 Combine everything but the meat in a bowl, mix, and set aside. Add the ground meats to a large non-stick skillet over medium-high heat and cook, stirring often and breaking up the meat, until no pink remains, about 7 minutes. Drain any excess liquid from the meat mixture, and then return to the heat. Add the vinegar mixtures, stir, and cook 2 minutes or until the liquid is almost all cooked off. Transfer 1-2/3 cups to a container for the nachos, and another 2 cups to a container for the eggs. Stash those in the fridge for later in the week, and then use the remaining chorizo mixture for the sweet potato dish. Preheat the oven to 400 degrees. Scrub the potatoes well, pierce with a fork, and wrap in foil. Bake for one hour. Heat a drizzle of olive oil in a large non-stick skillet over medium-high heat. Add the chard and cook 4 minutes, stirring often. Stir in the reserved chorizo mixture, along with the raisins and lemon juice. Season with salt and pepper, and cook until everything is combined and hot. Cut open each potato, and divide the chorizo-chard mixture between them. 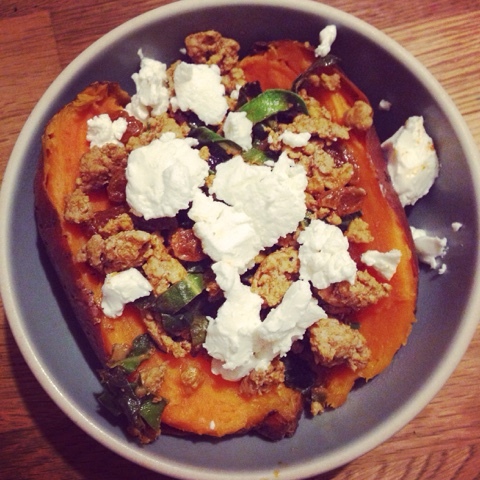 Top with crumbled goat cheese. Serve with a light salad on the side. 1-2/3 cups reserved chorizo mixture, from above. Preheat the broiler and line a large baking sheet with foil. Combine the chorizo and beans in a small pot and heat, stirring often, until heated through. Create a layer of chips on the baking sheet, and top with half of the chorizo-bean mixture, shredded cheese and green onions. Repeat, to create a second layer of chips and toppings. Broil one minute, or until the cheese is melted and bubbly. Top with the salsa, avocado, and cilantro, and serve right away! Heat a drizzle of olive oil in a large skillet over medium heat. Add the onion and saute 5 minutes. Add the minced garlic and bell pepper, and cook for another 5 minutes. Stir in the cumin, salt, and crushed red pepper. Stir for about 30 seconds, and then add in the tomatoes and chorizo. Bring to a boil. Cover, reduce heat, and simmer 5 minutes. Uncover, and for 4 indentations in the sauce using the back of a spoon. Crack each egg into a small bowl, and gently slip into each indentation. Cover, and cook 8 minutes or until the whites are set. Sprinkle with cilantro and serve with garlic bread or tortillas on the side for dipping. This super-savory dish hits all the right notes, even if it's not the prettiest thing I've ever made. The bottom layer combines sweet caramelized onions, smoky bacon, earthy lentils, and golden raisins for a little pop. This takes a while to make mostly because onions take for-ev-er to caramelize properly, but it's so worth it! The bacon is awesome, but you could definitely skip it for an all-vegetarian version (maybe add some smoked paprika?) Tangy baked feta goes on top - I haven't made feta this way before, and it really transforms the ingredient! Make sure you buy feta in a block, rather than the pre-crumbled type, for this to work properly. 1. Melt a big cube of butter in a large nonstick skillet over medium heat. Add the onions and cook, stirring often and reducing heat as needed, until nicely caramelized (30-45 minutes). When the onions are getting close, push them to the side of the skillet and add the bacon pieces, cooking until crispy. Then add the raisins and stir everything together. Cool for a few more minutes to combine everything. 2. Meanwhile, bring a pot of water to a boil, and add a generous pinch of salt. Rinse the lentils well, and add to the pot. Reduce heat to a simmer and cook until tender, 30 minutes or so. Drain and add to the onion mixture. Stir everything to combine. 3. Meanwhile, preheat the oven to 400 degrees and line a baking sheet with foil. Spray with oil. Lay the feta in the middle, and top with the sprigs of thyme. Drizzle with oil, and sprinkle with chili flakes. Fold up the edges of the foil around the cheese. Press or crimp the edges together. When the onions/lentils have about 10 minutes remaining, pop the feta in the oven and bake for 10-12 minutes. 4. 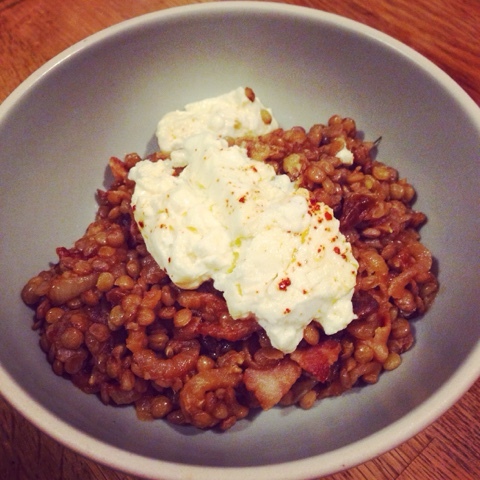 To serve, scoop the lentil mixture into bowls and top with the baked feta. Squeeze a little lemon juice over each portion. It's that time again, time for the Bachelorette! I have my fantasy team drafted, the DVR set, and Chad is pretty much the most hilarious villian in Bachelor/Bachelorette history. Below: a couple of cocktails I've made in recent weeks. The JoJo is a super tart, super pink blackberry-limeade number that I made a couple of weeks ago. The Evan celebrates our favorite doomed ED specialist's epic tattle tale-turned-into-rose moment from last night with blueberries, lemonade, and bubbles. Both are just-sweet-enough (add more simple syrup if you like a sweeter drink), and combine juicy summer berries and citrus. You can easily switch out the alcohols for anything clear (gin, vodka, or pisco would work in both cocktails), swap lemon and lime juice, or try a different berry for a new drink. 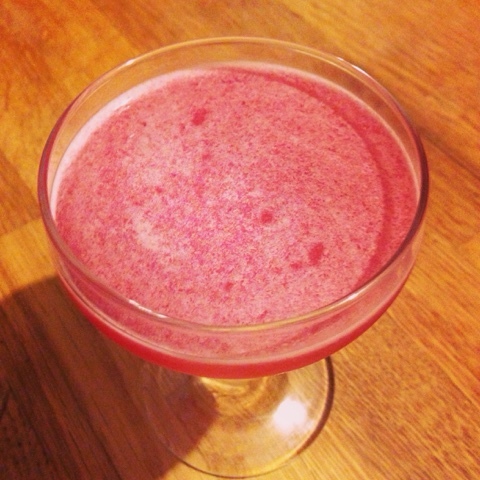 Either way, this season demands pink cocktails! Muddle the berries and basil in a cocktail shaker. Add the gin, lime juice, simple syrup, and a few cubes of ice. Shake until super cold, then strain through a fine-mesh strainer into two coupe glasses. Muddle the blueberries in a cocktail shaker. Add the vodka, lemon juice, and simple syrup, along with a few cubes of ice. Shake until cold, and then strain over ice. 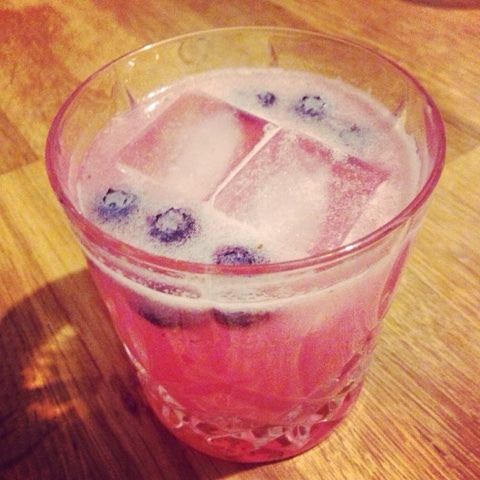 Top off with seltzer and a few more blueberries.